The hybrid is very clean and efficient. On a very low burn, the hybrid is primarily a catalytic stove, and on a medium burn, both the secondary combustion and the catalytic combustor are active. The air/fuel ratio is always sufficient to produce a clean burn. However, at high burn rates, most of the available oxygen in the hybrid stove is consumed by the secondaries. At peak burn, the catalyst can become starved for air and its capacity may not be fully utilized. At high burn rates, virtually all stoves have emmissions that go up, and efficiency that goes down. We first attacked this problem (with some success) in lab tests by actively injecting air (with a fan) into the firebox/pre-cat area. We later found that we could achieve the same result by passively allowing additional air (“catalyst air”) into the stove as the stove and chimney heated up. 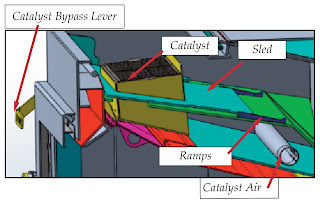 The intake point for the catalyst air is downstream of the firebox and upstream of the catalyst. 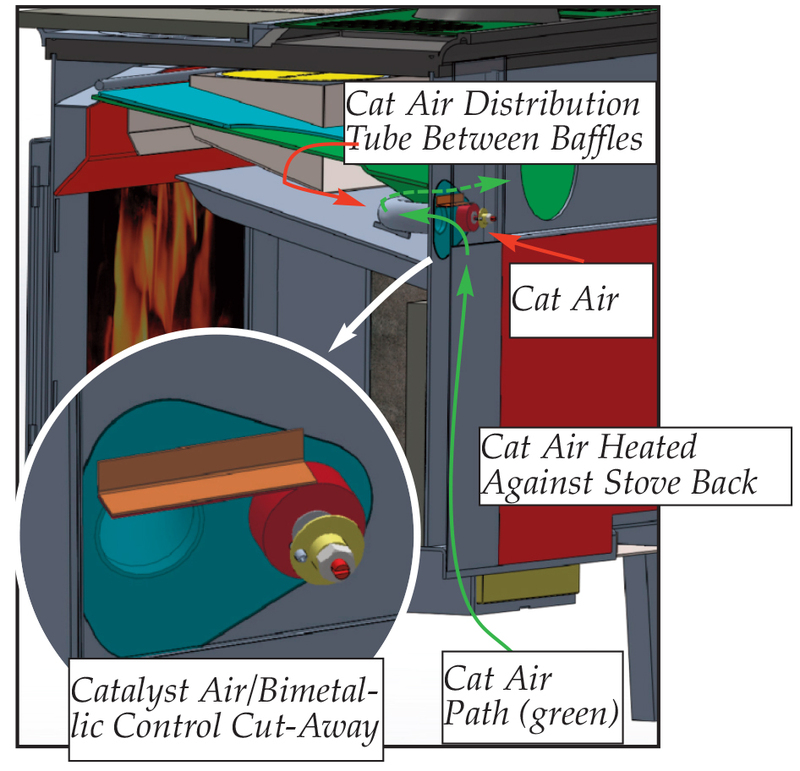 As the stove heats up and catalyst air is increased, the flow of primary and secondary air is stabilized, and at high temperatures it is actually reduced, improving emissions, efficiency and burn times. 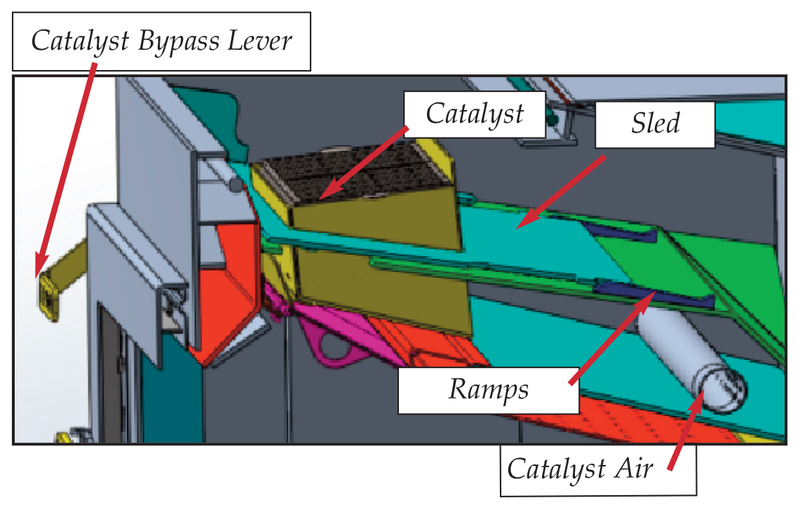 The catalyst air inlet is quite simple. A bi-metallic coil opens the inlet damper as the stove heats up, and closes it as the stove cools down. Catalyst air is distributed downstream of the firebox, and upstream of the catalyst. The “catalyst air” improves emissions and efficiency at high burn rates, provides overfire protection, and stabilizes the burn rate. 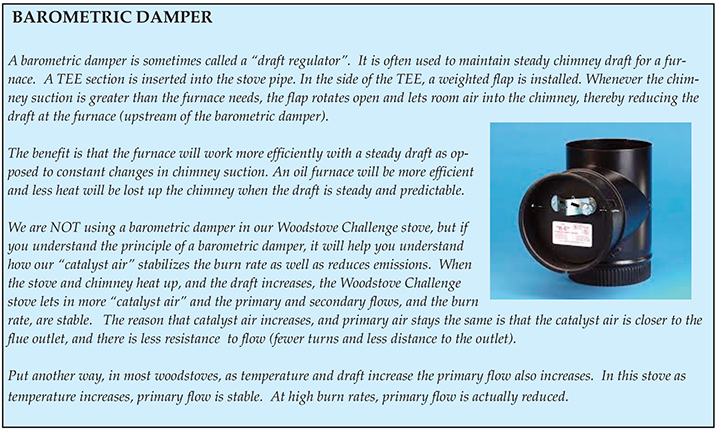 The regulatory function of “catalyst air” is conceptually much like a barometric damper (see box below), except that it’s inside the stove and targeted at emissions as well as efficiency and burn rate. 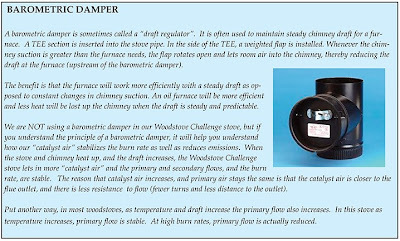 Like the barometric damper, the operator doesn’t have to do anything to control “catalyst air; it is self adjusting. More on this later when we release the results of EPA testing.